Do Tankless Water Heaters Need Less Maintenance? 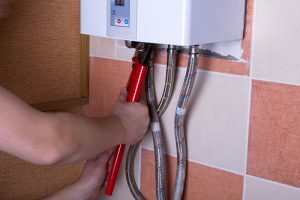 When you hear the words “water heater,” you most likely imagine a storage tank water heater—the large, metal cylinders that get installed somewhere out of the way in your home. These are the most popular heaters used across the country, and for good reason. They’re inexpensive to install and they last a good ten to fifteen years. On the other hand, you may have heard about tankless water heaters. These devices heat water on demand, so they don’t need a storage tank to hold heated water. Both tank and tankless water heaters will need the same amount of maintenance. Even though their components are drastically different in some areas, they’re both machines that come into constant contact with heated water and mineral deposits. They also both have heating components that need to be regularly checked. Still confused? We’ll break it down for you by going over the differences between the two. The anode rod: This is a rod made of various metals that, when dissolved, help strengthen the tank against rusting. However, the rod will deteriorate over time, so it’s crucial that it is replaced before it’s too late. Glass lining: If the anode rod fails to protect the tank, the glass lining is the second line of defense. Even then, the glass lining isn’t a particularly good defensive measure. It’s purely a backup meant to buy more time. Tank flushing: This is not a built-in feature of the water heater, but rather, a service that is performed with maintenance. Mineral deposits that build in the tank will do damage if left to sit for too long. Flushing the tank is necessary to avoid leaks and reduced efficiency. In addition to ensuring that the tank is well-protected, general plumbing maintenance will be performed around the plumbing and heating components. In contrast, it makes sense than a tankless water heater would require less maintenance, but that’s not the case. Tankless water heaters don’t have anode rods or glass linings, but hard water affects it all the same. Large quantities of calcium and magnesium in the water will gradually create limescale, a hard and chalky white substance. It can build up on the heat exchanger, forcing the heater to work overtime, and can eventually damage it beyond repair. If your tankless water heater is set to a high temperature, that can accelerate the buildup of limescale. You’ll want to have the tank thoroughly descaled by a Port Charlotte plumber more than once a year if you run very hot water or live in an area with high concentrations of hard water. Trying to decide on the best water heater for your home? We can help! Contact Bruno Total Home Performance today.